Chop 500g of back bacon and place in a lightly oiled lasagne dish or Pyrex roaster, put this in the oven and turn it on to 180° C. Peel and slice to varying thickness 1Kg of Maris Piper or similar potatoes and bring them to the boil in a saucepan of water, meanwhile slice and soften 1 large leek. When the potatoes have been simmering for 5 minutes, drain them and leave them to steam. Gently warm 600ml of double cream in a saucepan and drop in 500g of ricotta cheese and season well; as this slowly melts (don't worry if this isn't a perfect process, some of the cheese being left un-melted is fine) wizz up 150g of breadcrumbs, 150g of grated mature cheddar and 5g grated parmesan. 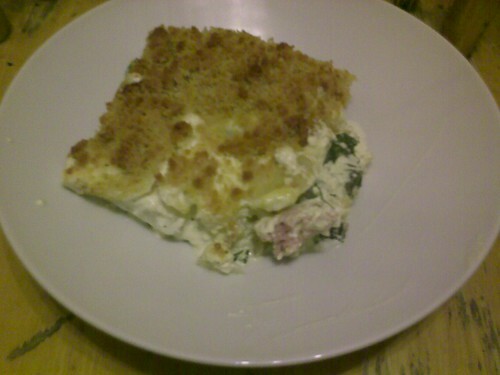 Pull the dish of bacon from the oven and pour off any excess water (if there is too much of this consider a new brand of bacon) and mix in the leek, then layer over first 225g of washed spinach then the potatoes, pour over the cream and cheese mix then sprinkle over the breadcrumb mix. Bake in the oven until the topping is golden brown on top the sauce is bubbling up from underneath. Variations: use white fish fillets instead of the bacon (will need to be watch much more carefully while you complete the remaining steps) or just use more leeks plus some peppers and courgettes for a vegetarian alternative.